Thank you to everyone who has participated in the engagement process to date. 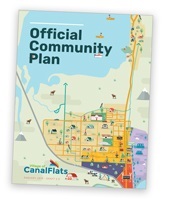 We are very excited to be sharing a draft of the Village of Canal Flats Official Community Plan for review and comment. In the files below, you will find the draft Official Community Plan, the Open House Boards that were presented at our latest event in February 2019, and an editable PDF of the feedback form. Please review the Open House Boards and fill in the feedback form. Once you have saved your comments, you can email the PDF to us at engage@bapg.ca. We value your feedback and are looking forward to improving the plan! Thank you for your participation in the Village of Canal Flats Official Community Plan & Zoning Bylaw Public Engagement Sessions that took place August 30 & 31. We appreciate your feedback and your comments are being taken into consideration. We want to keep our interested stakeholders informed and the process transparent, so we have compiled a What We Heard report. Be sure to check it out in the link below.